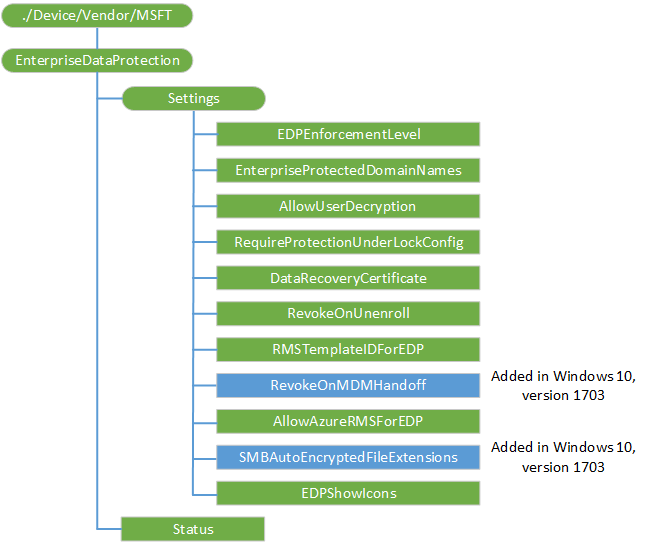 The EnterpriseDataProtection configuration service provider (CSP) is used to configure Windows Information Protection (WIP) (formerly known as Enterprise Data Protection) specific settings. For more information about WIP, see Protect your enterprise data using Windows Information Protection (WIP). To make WIP functional the AppLocker CSP and the network isolation specific settings must also be configured. For more information, see AppLocker CSP and NetworkIsolation policies in Policy CSP. This CSP was added in Windows 10, version 1607. While WIP has no hard dependency on VPN, for best results you should configure VPN profiles first before you configure the WIP policies. For VPN best practice recommendations, see VPNv2 CSP. The following diagram shows the EnterpriseDataProtection CSP in tree format. The root node for the CSP. The root node for the Windows Information Protection (WIP) configuration settings. Set the WIP enforcement level. Note that setting this value is not sufficient to enable WIP on the device. Attempts to change this value will fail when the WIP cleanup is running. 0 (default) – Off / No protection (decrypts previously protected data). 1 – Silent mode (encrypt and audit only). 2 – Allow override mode (encrypt, prompt and allow overrides, and audit). 3 – Hides overrides (encrypt, prompt but hide overrides, and audit). Supported operations are Add, Get, Replace and Delete. Value type is integer. A list of domains used by the enterprise for its user identities separated by pipes ("|").The first domain in the list must be the primary enterprise ID, that is, the one representing the managing authority for WIP. User identities from one of these domains is considered an enterprise managed account and data associated with it should be protected. For example, the domains for all email accounts owned by the enterprise would be expected to appear in this list. Attempts to change this value will fail when the WIP cleanup is running. Changing the primary enterprise ID is not supported and may cause unexpected behavior on the client. Note The client requires domain name to be canonical, otherwise the setting will be rejected by the client. Transform the ASCII characters (A-Z only) to lower case. For example, Microsoft.COM -> microsoft.com. Call IdnToAscii with IDN_USE_STD3_ASCII_RULES as the flags. Call IdnToUnicode with no flags set (dwFlags = 0). Supported operations are Add, Get, Replace and Delete. Value type is string. Allows the user to decrypt files. If this is set to 0 (Not Allowed), then the user will not be able to remove protection from enterprise content through the operating system or the application user experiences. Starting in Windows 10, version 1703, AllowUserDecryption is no longer supported. Specifies whether the protection under lock feature (also known as encrypt under pin) should be configured. A PIN must be configured on the device before you can apply this policy. 0 (default) – Not required. Most restricted value is 1. The CSP checks the current edition and hardware support (TPM), and returns an error message if the device does not have the required hardware. Note This setting is only supported in Windows 10 Mobile. Specifies a recovery certificate that can be used for data recovery of encrypted files. This is the same as the data recovery agent (DRA) certificate for encrypting file system (EFS), only delivered through MDM instead of Group Policy. Note If this policy and the corresponding Group Policy setting are both configured, the Group Policy setting is enforced. // Current format of recovery data. // Sid of owner of the public key (regardless of format). // This field is to be treated as a hint only. // a NULL terminated WCHAR string. // The exported public key used to encrypt the FEK. For EFSCertificate KeyTag, it is expected to be a DER ENCODED binary certificate. Supported operations are Add, Get, Replace and Delete. Value type is base-64 encoded certificate. This policy controls whether to revoke the WIP keys when a device unenrolls from the management service. If set to 0 (Don't revoke keys), the keys will not be revoked and the user will continue to have access to protected files after unenrollment. If the keys are not revoked, there will be no revoked file cleanup subsequently. Prior to sending the unenroll command, when you want a device to do a selective wipe when it is unenrolled, then you should explicitly set this policy to 1. 0 – Don't revoke keys. 1 (default) – Revoke keys. Added in Windows 10, version 1703. This policy controls whether to revoke the WIP keys when a device upgrades from MAM to MDM. If set to 0 (Don't revoke keys), the keys will not be revoked and the user will continue to have access to protected files after upgrade. This is recommended if the MDM service is configured with the same WIP EnterpriseID as the MAM service. TemplateID GUID to use for RMS encryption. The RMS template allows the IT admin to configure the details about who has access to RMS-protected file and how long they have access. Supported operations are Add, Get, Replace and Delete. Value type is string (GUID). Specifies whether to allow Azure RMS encryption for WIP. 0 (default) – Don't use RMS. Added in Windows 10, version 1703. Specifies a list of file extensions, so that files with these extensions are encrypted when copying from an SMB share within the corporate boundary as defined in the Policy CSP nodes for NetworkIsolation/EnterpriseIPRange and NetworkIsolation/EnterpriseNetworkDomainNames. Use semicolon (;) delimiter in the list. When this policy is not specified, the existing auto-encryption behavior is applied. When this policy is configured, only files with the extensions in the list will be encrypted. Determines whether overlays are added to icons for WIP protected files in Explorer and enterprise only app tiles in the Start menu. Starting in Windows 10, version 1703 this setting also configures the visibility of the WIP icon in the title bar of a WIP-protected app. 0 (default) - No WIP overlays on icons or tiles. 1 - Show WIP overlays on protected files and apps that can only create enterprise content. A read-only bit mask that indicates the current state of WIP on the Device. The MDM service can use this value to determine the current overall state of WIP. WIP is only on (bit 0 = 1) if WIP mandatory policies and WIP AppLocker settings are configured. Bit 0 indicates whether WIP is on or off. Bit 1 indicates whether AppLocker WIP policies are set. Bit 3 indicates whether the mandatory WIP policies are configured. If one or more of the mandatory WIP policies are not configured, the bit 3 is set to 0 (zero). Bits 2 and 4 are reserved for future use. Supported operation is Get. Value type is integer.